BOGOTA (Reuters) - Colombia will allow Venezuelans to cross the border using expired passports in view of the difficulty of renewing travel documents in the neighboring country in the midst of its economic crisis, the migration agency said on Friday. More than 1.2 million Venezuelans fleeing widespread food and medicine shortages and a complex political crisis have migrated to Colombia in recent years, overtaxing the South American country's already-limited public healthcare, housing and utilities. Many arrive without visas because they are unable to renew their passports. Passport renewals in Venezuela are "nearly impossible because of the high cost of the document, because of a lack of primary materials to make them and because of other actions from the Venezuelan side to curb the exit of Venezuelans," said Christian Kruger, the head of Colombia's migration agency. Venezuelans will now be able to use old passports for up to two years after their expiry date, Kruger said in a statement. 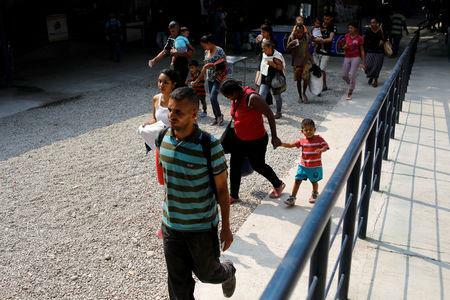 The measure is part of recent agreements made by the Lima Group bloc of nations to give migrants security and prevent them from turning to trafficking gangs in order to cross the border, the statement said. Most Western nations recognize opposition leader Juan Guaido, and not President Nicolas Maduro, as Venezuela's legitimate leader. An attempt by Guaido to bring hundreds of tonnes of humanitarian aid into Venezuela was largely stymied last month by Maduro, whose troops blocked convoys of aid trucks, leading to clashes that killed at least six people. "There is nothing more dangerous for a country than not to know who is within its borders. Shutting the frontier and demanding official documents from a population that is fleeing a dictatorship because of hunger and want only incentivizes irregularities," Kruger said.